ABR is full service ski touring center with 75km of trails located on over 1100 scenic acres of varied terrain along the Montreal River in Ironwood Michigan. We work on the trails full-time in the off months and have done substantial trail work each and every year since we opened to the public in 1995. In 2005 we did a major redesign of the trail system, including adding new trails and many revisions. In 2008 we did another major redesign putting our total k’s up to 60 km. You will most likely need to review the new map which was created with a survey grade of GPS. Pay attention to directional signs, some of the trails are now being skied in a different direction and a different sequence. 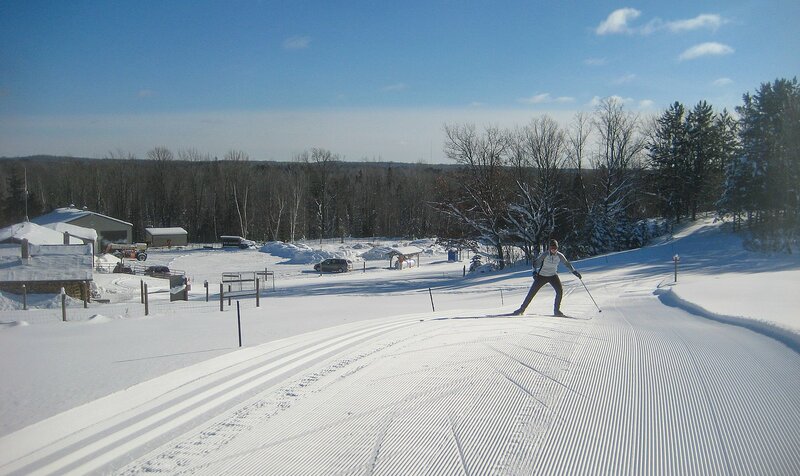 This year we worked on a connector into downtown Ironwood that will be used for the SISU Ski Fest. Rudy’s Shoot was widened and regraded so it can be groomed with the Pisten Bully and will be skating and striding, it is also longer now and more accessable from the rental houses. We also did a considerable amount of work on fixing trouble spots in the exisiting trails that will make the trails ski better and groomer easier including regrading and banking the tricky Blueberry hill to make it more skiable. Read articles on our trail construction in our Trails archive. And news on skiing and our snow season is in our Skiing archive.